A procession passes Charing Cross, on the outskirts of London. University of Victoria Library. London's streets were notoriously narrow and congested. As the population increased to 200 000 in 1600, street travel became a particularly cumbersome affair. The streets were a noisy place: salesmen shouted out their wares, bells rang and beggars could be heard on every street corner. Hygiene was a serious problem; waste had to be regularly removed from alleyways and diseases such as smallpox, "sweating sickness"* and the plague spread easily through the street crowds. Fleet Street was one of London's better known streets; here puppet shows, naked "Indians" and strange fishes were put on display for the public's amusement*. As one of Europe's most important trading centers, London attracted a variety of people, some less reputable than others. The city was of special interest to criminals, since its large transient population and accessible money made it an easy target. Vagrants who had been chased out of neighbouring jurisdictions found the city's anonymity particularly appealing; they also flocked to London's relatively well organized charities. Numerous prisons were scattered across the city, among them Bridewell, Newgate, the Clink, the Cage, the Cripplegate and the Compter or Counter*. Prisons were packed with the poor, who mostly landed there as a result of unpaid debts. Their cries could be heard on the streets and it was not uncommon for men or women to push food or clothing through the prison bars from the streets. The dissolution of the monasteries under Henry VIII, overpopulation, and a steady influx of immigrants all contributed to the large number of poor in London in the late 16th century. The closing of the religious houses was a calamity for the poor because it meant they could no longer rely on the Church for charity. Some religious buildings were transformed into places of refuge for the poor -- St. Thomas' Hospital, once a religious house, became a place of lodging for the destitute and diseased*-- but a large number of these buildings were either taken over by the nobility or simply destroyed. The city's attempts to limit overcrowding did nothing to aid the poor. On her acession to the throne, Elizabeth I issued a proclamation prohibiting any unlicensed building within three miles of London. The lack of space meant that the poor had nowhere to go, a problem Elizabeth seems to have chosen to ignore, and which would continue under James I.
Labourers' wages were kept low, largely because of the immigrants pouring into the city in search of work. Huguenot and Flemish refugees eroded the power of the guilds by establishing new industries outside the city's jurisdiction. While labour was difficult to find and wages were low, food prices kept rising as the demand grew with the population. Dismissed soldiers and sailors added to the already substantial number of unemployed. "Sweating sickness" was a general term for any disease that produced a fever. Often it referred to malaria (common in England at the time), which produced bouts of fever at regular intervals; it might also refer to the flu. A strange fish! Were I in England now, as once I was, and had but this fish painted, not a holiday fool there but would give a piece of silver: there would this monster make a man; any strange beast there makes a man. When they will not give a doit [a small coin] to relieve a lame beggar, they will lay out ten to see a dead Indian. A hound that runs counter [punning on the prison, and following a scent in the wrong direction] and yet draws dryfoot [follows a dry scent] well. 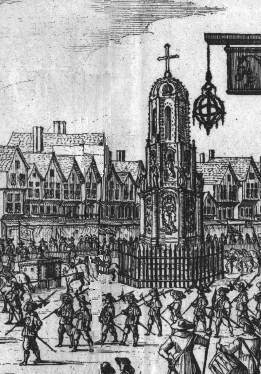 In the year 1552, the citizens of London having purchased the void suppressed hospital of St. Thomas in Southwark, in the month of July began the reparations thereof, for poor, impotent, lame, and diseased people, so that in the month of November next following, the sick and poor people were taken in.